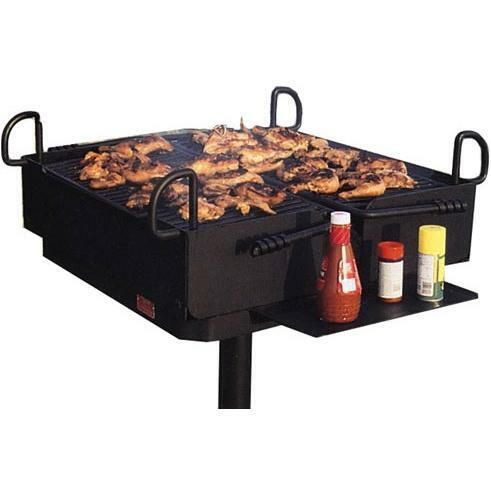 This BBQ Charcoal grill features 2 separately adjustable cooking surfaces. Reinforced grate is virtually indestructible. Grate tips back for fire building and cleaning. Firebox is ring and flange reinforced. Theft-deterrent base attachment. Full rotation for draft control. Steel construction. 1040 square inches cooking area. Firebox dimensions: 32 x 32. 5 x 8 high. Must be mounted in concrete. Base is 40 long by 3. 5 in diameter.